The drive by public agencies to provide information and services on the Internet opens up a way for Americans to contact government that was not available a decade ago. This report takes stock of how e-government is faring by placing e-gov in the context of the other ways people get in touch with government, such as telephone calls, in-person visits, and letters. It then assesses whether different means of contact – or other factors – are connected to the rates of success and satisfaction that users report when they reach out to government. This comparative look at how Americans get hold government reveals the benefits and limits of e-government at its current stage of evolution. The benefits involve expanded information flows between governments and citizens. In addition, many citizens say the Internet helps in conducting their business with government. Americans with Internet access are much more likely to contact the government than non-Internet users, showing that Internet users have strongly embraced a new communications medium to contact government. The conveniently available information offered at government Web sites makes it easier for Americans to conduct their business with government by whatever means they choose. The ease of email makes it possible for citizens to fire off a missive to express a view about policy or highlight a problem with neighborhood garbage pickup. The upshot is that Internet users say that e-gov improves their relationship with government. It is important to note, however, that there is no independent effect of Internet use on the chances of success with government. E-gov is not yet the “killer app” among the available tools to contact government. The limits of e-gov have to do with people’s technological assets, preferences, and the wide range of problems people bring to government. Not everyone has Internet access – about one third of American adults do not – which means that phone calls, in-person visits, or letter-writing are the available options to contact government for a large share of the population. Many people simply do not choose to use the Web or email to get in touch with government. In fact, those who contact government, including Internet users, are most likely to say they prefer to use the telephone to do so. And not all problems lend themselves easily to e-gov solutions. “Real time” interaction with government – the telephone or in-person visits – is preferred when people have urgent or complex problems to sort out with the government. In sum, e-gov is a helpful tool among several options for reaching out to government, but it is by no means the “killer app” among them. People’s problem-solving capacities matter to successful outcomes with government, not a specific technology. As policymakers expand the offerings of e-government, they would be wise also to maintain and upgrade the other channels that citizens use to contact government, with a focus on how these traditional channels may complement e-gov applications. Data from our July 2003 survey of 2,925 Americans fill out the picture of how many Americans contact government, what for, by what means, and with what outcomes. The data also show how the Internet is used by citizens in their dealings with government. Much of the analysis focuses on a group we call Government Patrons – people who contacted government in the past year for reasons not related to the simple act of mailing in tax returns. The total number of Government Patrons is roughly 109 million adults (those 18 and older). » A plurality of Americans who contact government do so via the telephone. Using a government Web site is the second most frequent approach for contacting government. Here’s how the numbers break down for all Government Patrons. The percentages total to more than 100% because respondents were permitted to give multiple responses. 42% said they used the telephone the last time they contacted government. 29% said they visited a government Web site to contact government. 22% use multiple means to contact government. » When Government Patrons were asked what way they would most prefer to contact government, the telephone was again the top choice. 40% of those Government Patrons say they would prefer to use the phone to contact government. 24% say they would prefer to use the Web. 13% say an in-person visit would be the way to go to contact government. 11% would prefer to use email to get hold of government. 10% would prefer to write a letter. » More than half of all Americans contact the government in a given year. 30% of all Americans contact government for reasons relating to a transaction such as renewing a car registration. 25% contact government to get an answer to a specific question, whether that is about eligibility for a government benefit or finding out the hours of a nearby park. 19% register their opinion with government agencies on issues and policy questions. 11% contact government seeking out help for a specific problem. » Internet users are more likely than non-users to contact government. 72% of Internet users contacted the government in the past year. 23% of non-Internet users contacted government users in the past year. Among Internet users, 30% say they have used email or the Internet to try to change a change a government policy or influence a politicians vote on a law. » People generally have success when contacting government, and they report high rates of satisfaction with their interactions with government. Fully 63% of Government Patrons say that they had a successful outcome the last time they contacted government. No single mode of contact, whether phone, email, Web, or letter, is associated with greater success than others. Three-quarters (76%) say they are satisfied with how their last contact with government went, with 35% saying they were “very” satisfied and 41% saying they were “somewhat” satisfied. » Success in their interactions with government is influenced by people’s education and problem-solving skills, not just their technological assets. Internet users who contact government using any communications channel are more likely than non-users to report that they have been successful in their most recent interactions with government, by a 65% to 53% margin. These differences, however, are not solely attributable to some inherent benefit brought about by Internet use. Rather, educational and attitudinal factors come into play in predicting success. Those with higher levels of education and those who think government can be trusted are more likely to be successful with government than those without those characteristics. » Some types of government contacts lend themselves to success, but some do not. Most Government Patrons (82%) are successful when conducting a transaction such as getting a license, probably because transactions have clear-cut conclusions. Only about a third (36%) say they are successful when they express an opinion to government. This is not surprising given the low probability that the opinion of a single individual will influence a government outcome. The complexity of a Government Patron’s problem matters to the outcome. Half (49%) of those with complicated problems say they have successful outcomes, and half (52%) who contact government to solve a specific problem were successful. » Some problems lend themselves to “real time” interaction with the government. That means Government Patrons prefer using the telephone or visiting government offices as they deal with public agencies. Other problems are well suited for the Web or email. For very complex problems or contacts that in some way involve problem-solving, the phone or in-person visits are preferred by 62% of Government Patrons. Only about one-quarter prefers the Web or email in these instances. For general information-seeking from government, the gap is much smaller. The telephone or in-person contact is still preferred (by 51% of Government Patrons), but Web or email is preferred by 43% of Government Patrons. » Demographic characteristics also come into play with successful interactions with government. Older people have lower rates of success with their last government contact, as 55% of those over age 65 said they were successful compared with the 63% average. Education is a clear dividing line: only 48% of Americans with a high school education or less said they were successful in their last contact with government. Some racial divides exist; 66% of whites say there were successful in addressing their issue the last time they contacted government, while 51% of non-Hispanic blacks said this and 55% of Hispanics did. » People sometimes encounter problems when they contact government. Those who use the phone are more likely to report problems than those who use the Web. Overall, 59% of Government Patrons who contact the government by phone encounter a problem of some sort. 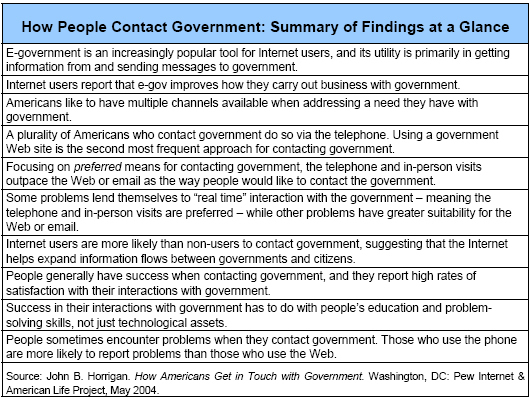 Among Government Patrons who contact the government through the Web, 46% encounter some kind of problem. The leading problem for those who contact the government by telephone is time; 36% say they do not have enough time to stay on the phone or make repeated calls to government agencies and 31% say they get put on hold for extended periods of time. Government Patrons who use the Web to contact government say their top problem is not being able to find the right information. Relatively few (one in eight) Web users say that bad links or unclear instructions to download needed forms are problems. People with disabilities are significantly more likely than others to encounter problems when contacting government using the phone or the Web. » Fully 77% of Internet users – or 97 million Americans – have at some time gone online to search for information from government agencies or to communicate with them. As of the middle of 2003, use of the Internet to interact with government had grown 50% since the middle of 2002. In other words, roughly three fourths of Net users have done at least one of the following six e-gov activities, with the average user doing about three of them. 66% of Internet users have looked for information from a local, state, or federal government Web site. 41% of Internet users have done research involving official government statistics or documents online. 34% of Internet users have gotten recreational or tourist information. 28% of Internet users have gotten advice from a government agency about a health or safety issue. 27% of Internet users have sent an email to the federal, state, or local government. 23% of Internet users have gotten information or applied for government benefits online. 41% used the telephone to contact government. 19% visited an agency in person. 38% used the telephone to contact government. 20% visited an agency in person. » The Internet provides some efficiency payoffs for citizens in their interactions with government. Net users report that it takes less time for Net users to conduct their government business compared with non-Internet users. When asked whether the last contact they had with government took less time than they expected, 27% of Internet users said it did compared with 22% of non-users who reported quicker-than-expected interactions with government. » Internet users report that the Net helps in their dealings with government. The Internet has a significant impact on users’ views about dealing with government. Half of all Internet users and 59% of those with broadband at home feel that the Internet has helped their relationship with government. These perceived benefits also probably have to do with information reducing people’s uncertainties when they approach government. The additional information gathered online may contribute to feelings of efficacy when people reach out to government, even if its substantive benefit is hard to discern. » The Internet is the principal tool in getting certain types of government information, but not for sensitive information or some transactions. 39% of all Americans said they would use the Internet to find out about government benefits and 28% said they would use the phone for that. To find out about programs an agency offers, 53% of all respondents said they would turn to the Net and 23% said they would use the phone. For more sensitive queries, such as personal tax questions, people turn more often to the telephone than the Net by a 51% to 17% margin. For several types of transactions, such as auto licenses, recreational licenses, or professional licenses, “some other way” (presumably in-person visits) lead the way, with both the phone and the Internet lagging significantly.